If there was only one children’s book I could put on the list of must-read, yet hardly known, children’s books, it would have to be Momo. I fell in love with the book, despite the fact that when I first went to read it, I assumed I wouldn’t like it at all! It was been out of print in the USA for a few years, but as of August, 2013, was beautifully reprinted by McSweeney’s McMullens as a 40th Anniversary Edition edition. The author, Michael Ende, is better known for his other children’s book, Neverending Story, which is also quite good, but I like Momo best of all. The heart of why I love this book is that throughout the heart-stopping adventures of the loveable waif Momo, there is a message of hope. 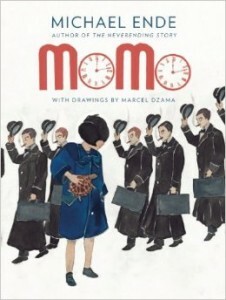 Although a children’s book, Momo can be read as a social commentary, if you are reading it as an adult or an older teen. However, as a child, the message is really one of goodness, truth, and beauty. The child’s imagination is led into a world unlike any other as Momo journeys to a timeless place where Professor Hora keeps the heart of the world ticking. Throughout this masterpiece, the reader is kept in suspense. What will happen to the world? Will evil prevail? Not until the very end is all revealed, so it’s impossible to put the book down. This book is best suited for older readers, ages 11 and older. It’s a good 6th grade class book and would also work as a high school book for the social commentary. Younger children would need to have excellent reading skills and the ability to follow intertwining plots. It is safe to say that any child who can read and follow Harry Potter can easily read this, as there are far fewer characters. As for parents, read it at any age, but do read it! And thank you, McSweeneys for republishing this amazing story.